Man-Eating Kitten. I've mentioned the neighbor's cat, which stalks human beings like small prey. Lately, she's been getting bolder. 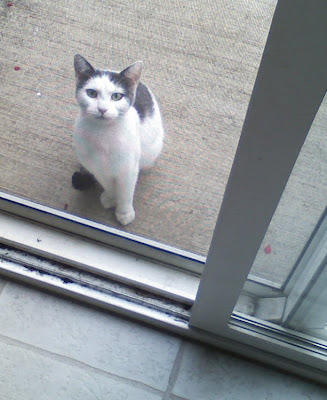 Here she is, standing at our back door, daring someone to come out so she can eat them. Behold the hungry look in her eyes!